Eversource is contracting with Pennsylvania-based Haverfield Aviation to repair Seacoast transmission infrastructure, using helicopters like this one. 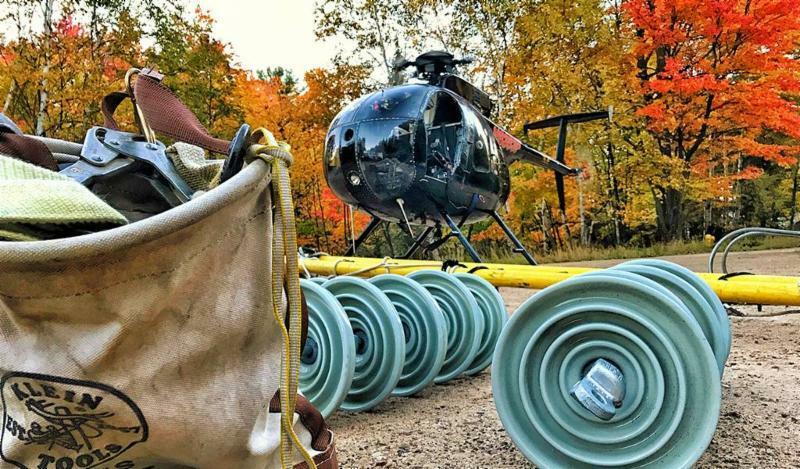 Eversource will fly helicopters around the Seacoast over the next week as it repairs some aging transmission infrastructure. The choppers will take contract workers along a transmission line in Greenland, Portsmouth and North Hampton, weather permitting, through Jan. 10. The utility says the repair crews will replace old insulators on that power line, which connects major electric substations in the area. The project is meant to make the grid more reliable during storms, and aid in future renewable energy connections, says Eversource spokeswoman Kaitlyn Woods. "As more of our customers and renewable energy generators connect their own generation resources to the grid, we must continue working to ensure a more modern, reliable transmission system," she says. Eversource also hopes to start building a major new power line on the Seacoast this spring, after winning state approval in December. Eversource’s residential customers will likely see their bills increase in February, after the utility asks state regulators to approve a proposed rate hike this week. New Hampshire's largest utility says it needs to increase its default electric service rate for the first half of next year by about half a cent per kilowatt-hour. Energy can be tough to understand. When we flip a light switch, we know the lights should come on. But we might not know where that power came from – or why it costs what it costs. In New England, much of those costs are controlled by a select group of stakeholders – called the New England Power Pool, or NEPOOL. NEPOOL is now facing criticism for a lack of transparency, and for decisions that could be raising the already high cost of energy in the region.